Are you looking to create something beautiful for your home? Want to customize a holiday get together or give a loved one a truly personalized gift? From customize gift ideas to wonderful home decor and wall art, everything becomes easy, fun, and inexpensive when you make your own printables. 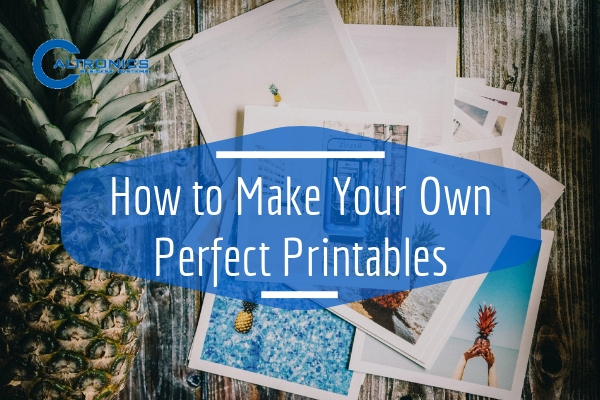 If you’re not sure how to create your own homemade printables, we put together a few steps so you can be well on your way to making fabulous and one-of-a-kind printables. Typography can make the biggest difference between a good printable and an amazing printable. You will not want to print your favorite quote in comic sans and hang it on your wall. While there are a collection of free font resources out there, pick the ones that will make your printable standout. DaFont, 1001 Free Fonts and Font Squirrel have a huge variety of high-quality fonts that are not just easily downloadable but are also free for commercial use. Whether you need something elegant, vintage, handwritten or unusual fonts, these websites got you covered. Sometimes coming up with your own design can take ages. So why not hop on Google and browse through some websites that offer useful and free clip arts. There’s a ton out there. A few websites that offer a myriad of stellar clip art include VectorStock, Clipart.com and Dreamstine. If you like to use Creative Commons image, Compfight, Pexels and Pxhere offer high-quality, professional-looking shots that can certainly make any printables eye-catching. Bring your well-crafted printable to life using a high-quality printer. If you already have your own printer at home, you’re in great shape. However, you must know that the type of printer you have can greatly affect the quality of your printable. If you want the colors to pop on the page, an inkjet printer is your best friend. Inkjet printers are great for photos and image-heavy documents as they blend colors smoothly. But you should note that a high-end inkjet printer can do much more wonders than low-end printers. So if you’re still on the lookout of a good printer, it’s worth paying a little more in exchange for higher quality. Looking for a printing solution that won’t burn a hole in your pocket but will produce an impressive output? We can help, just give us a call to discuss your needs. This entry was posted in Printables on September 21, 2018 by riehlt. Becoming productive in the workplace can sometimes be difficult. After all, there are so many distractions in the office that can affect our attention span. 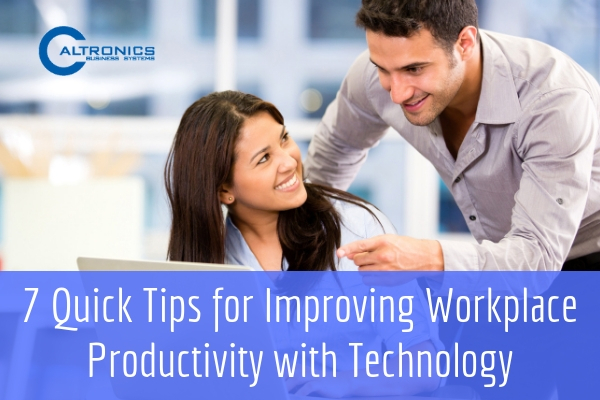 However, by equipping your employees with the most useful and advanced tools and systems available on the market, you can help boost their productivity. Here’s how you can use technology to empower your workforce. Whether in the office or out, effective collaboration between your people and customers is a guaranteed way to improve productivity. There’s a myriad of online tools with easy-to-use features that inspire teamwork and collaboration. Examples are Asana, Trello and Slack. Explore and try free versions and then pick out the best tool that suits your needs. It doesn’t always make sense to go back and forth in email chains and chat messages when you can pick up the phone and answer inquiries straightaway. This could mean making your phone system work regardless of where your employees are. Having one phone number that can ring on multiple devices is a surefire way to get issues taken care of quickly and efficiently. Instead of using physical equipment in an office, the cloud is a good place for storing documents and data remotely. Since projects on the cloud can be easily managed and accessed, your team can stay in touch and work collaboratively on the most up-to-date version of files – anytime and anywhere. Rather than take those long walks across the office, why not use modern instant messaging platform for faster and easier communication. Not only can you ask questions whenever you feel like, you can also get answers instantaneously. Through IM platforms, losing or not seeing an email is no longer an excuse. Messaging platforms are great for asking quick questions, sharing drafts, and even collaborating as a team in group channels. Messaging platforms can eliminate some meetings, which can be real productivity killers. By providing your team with portable devices such as laptop and tablet, they can be mobile and agile. Installing these devices with appropriate tools, your employees can stay in touch with colleagues and clients even when they’re on the field or out of normal working hours. This flexibility can increase team morale and, thus, improves productivity. Your employees cannot be productive if they’re suffering from slow, poorly performing computers. By giving them modern computers or updating computer software whenever necessary, you greatly boost their efficiency. Having a fast internet connection can also do wonders to the productivity of your people. Mind you, printers are indispensable office equipment even in a digital world. The latest printing and multifunction devices can enhance efficiency and productivity levels in your office by allowing your team to search within scanned documents, print from mobile devices, and reduce paper copy redundancies. And because of their advanced functionality, your team can access cloud tools directly from printers and multifunction devices with ease. Plus, modern printers work just like you would expect a smartphone to work, so less training is required for new users. At Caltronics, we can help you increase workplace productivity with the right printing solutions. Contact us about out Managed Print Services, Scanning Soltutions, Network Faxes, and more. This entry was posted in Solution, Uncategorized on September 18, 2018 by riehlt.